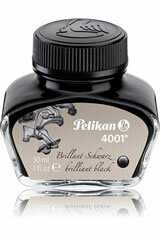 The Pelikan 4001 Bottled Ink is the original Pelikan fountain pen ink. Pelikan has been making the 4001 ink for more than one hundred years. This tried and tested ink guarantees bright shining colors and clear line definition in a smooth even flowing ink. This classic fountain pen ink is a must have for any fountain pen enthusiast. The Pelikan 4001 Bottled Ink(30ml) Fountain Pen Ink usually ships within 1 business day unless otherwise specified. Each Pelikan 4001 Bottled Ink(30ml) Fountain Pen Ink we sell is guaranteed to be genuine, authentic and will arrive brand new & unused! I have two inks in the 4001 line, the Royal Blue and the Dark Green. I had gotten a sample of the Dark Green from...somewhere, and at first wasn't impressed with it. But the more I used it, the more I loved it. Now it's my EDC green ink of choice. I haven't used the blue much, yet, but when I did use it, I found it a good workhorse blue. Not the most exciting blue out there, but that doesn't seem to be its intent. I understand it is THE ink for academic writing in Germany. So it's not supposed to be exciting. It's supposed to work, day after day. And that it does. Pelikan inks have a reputation for dryness compared to other big-name inks, probably because their pens write so juicy that they need a dry-ish ink to compensate. The "dry" reputation proved to be a selling point for me in some of my wetter-writing pens that needed some taming to write properly. I did try both inks in some of my drier pens and was pleased to see that the pens wrote well with both inks. So I'm not sure now that these inks are necessarily dry, or if that varies by color. The color variety isn't the greatest, none of them stand out for fancy tricks like shading, sheen or shimmer, but Pelikan does have some eye-catching colors in what they do carry. The turquoise and violet keep calling to me, so I may get them to see if they're as intriguing as they look. That they're so reasonably priced makes it easy to go for buying a bottle of ink, simply to give it a try. This is my favorite go-to blue ink. Nicely saturated without being too dark. Not a fan of brown in anything but needed a brown ink to go with a brown pen (yes I'm one of those people). Tried several brown samples and the Brilliant Brown was far and away the winner. It's not too dark but not too light. If you need or want a brown ink this is the one, you wont be disappointed. You will notice more scratchiness on the nibs of pens using this ink. That being said, it does tend to bleed a little less through the paper than standard inks. The Dark green is a lot like Waterman green in color, though perhaps a shade darker or more saturated. The bottle is a little squat small - not unlike the J Herbin bottles. There may be issues with filling pens when the ink gets lower. The mouth is nice and wide, though. Quality super because Pelikan make some of the best inks, ink flow did very well in my fountain pen, I love the color as well and the value fit my pocketbook .